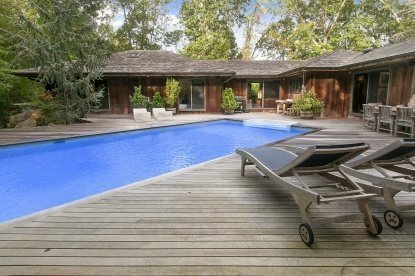 Rental Registration #: 16-661 Privately nestled at the end of a long driveway is this stylish 4 bedroom, 3 1/2 bath contemporary 3500 sq ft home just minutes to pristine bay beaches in East Hampton. This sun filled interior designers' home offers three separate wings, all with bedrooms opening onto private decks, and easy living on one level! A fully equipped office gazes onto private garden, which could serve as a 4th bedroom . The spacious living area opens to a large deck and pool with a Jacuzzi on the spacious deck. All of this is offered in the most serene atmosphere, it is extremely quiet both day and night. Superb for entertaining, this home has a modern kitchen with breakfast nook, great room with fireplace, sunken den beautifully decorated with a mixture of mid century modern . Located between East Hampton and Amagansett..